Whatever the occasion, make it special with a cake to celebrate. 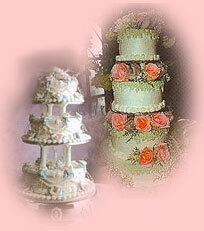 A cake from Aunty Joy is perfect for Weddings, Anniversaries, Christenings, Easter, Christmas or just to say thank you. I have always been interested in making and decorating cakes, so in 1992 I attended Sugar Craft courses. I then started making cakes as a hobby for friends and family which then went around the country thanks to word of mouth. It was with this good reputation that I decided to start Aunty Joy's Cakes. What to expect from your cake. All cakes are freshly made with the finest ingredients. Fruit cakes are pre-soaked in brandy to make the cake lovely and moist. All tastes are catered for, perhaps you would like your cake to feature a mixture of fruit and sponge? Or how about a chocolate, carrot or just a plain sponge cake? Cakes can be made in round, square, petal, heart and hexagonal shapes. Knives and cake stands are available to hire in silver or gold. Chrome three tiers 'S' shape and acrylic separators are also available. All cakes are tailor made to your specification, colour and size. Its your day, make it special with Aunty Joy's cakes. To add that finishing touch to your cake, why not have flowers individually made to match your colour scheme? Here are a few examples of Aunty Joy's Cakes. Click on a picture to enlarge. Email auntyjoyscakes@btinternet.com Now available cold finger buffets. For more information please call the number above.